Arts & Ages is an ambitious three year intergenerational arts programme nurturing partnerships between 8 primary schools and 8 groups of older people in Tower Hamlets (some of the older people will be based in care settings, some are living in the community where the groups will be centred on existing community organisations or places – eg Linc Centre). In Year 1 we will deliver a high quality arts project over 1 term, involving a whole class and local older people working together to create a performance, exhibition or celebration. Each project will be led by professional artists with experience in bringing generations together. Themes for these projects will be chosen and led by the group, and activities chosen to support relationship building and communication between the generations. Between projects, the school and older people partner (a care setting or community centre or organisation) will commit to a group of older and young people meeting up once a term, to ensure the relationship continues to grow and flourish. Magic Me will provide staff training and resources as needed to help partners stay connected. In Year 2 there will be flexibility for the partners to choose how their intergenerational relationship develops, this may not be a 10 week project, but might be a specific one off event or a series of smaller pop-up events. By allowing for this flexibility of scale and timing the partnerships can develop their own style and begin to develop their own processes and planning to lead them into Year 3. In year 3, the school and older people partner will run their own intergenerational activity led by ideas that have come from older and younger people in Years 1 and 2 of the project. Magic Me artists and staff will support this activity, and will help them to find a way for this to continue beyond year 3 of the project. 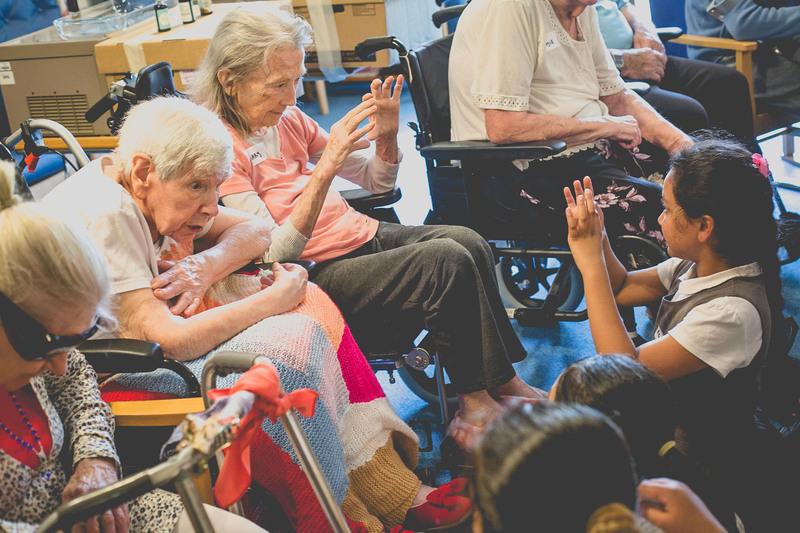 Examples of this activity might be setting up an intergenerational choir, or a termly creative assembly where older people take part alongside younger people. The 8 partnerships will not all launch at the same time and will have a staggered launch over the 3 years of the project. This allows Magic Me staff the time to nurture each partnership in its early stages. As the partners begin to exit the formal 3 year programme it is envisaged that Magic Me will facilitate an ongoing peer support network, additional training events and ad-hoc support to help partnerships endure long into the future. The artists we work with have a range of expertise and many of our projects bring together different disciplines, for example storytelling, collage, music and poetry. Our artists are experienced in facilitating intergenerational groups and understand how to create activities and projects which promote an equal exchange between all the participants so that everyone feels that they have a say in the direction of the project and are fully involved in making the work and bringing it to an audience – whether that is through a live performance or sharing or through the creation of an exhibition or artwork. Being sensitive to the various needs of an intergenerational group our artists encourage participants to discover their strengths and talents and use them to the full giving each individual an opportunity to challenge themselves creatively.